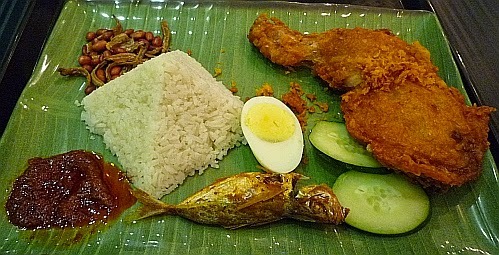 Nasi Lemak with Fried Chicken Leg - MYR10.90++ and add on a fried yellowtail scad (ikan selar kuning) for MYR2.50++. The pyramid shaped rice is made from scooping the rice with a pyramid shaped scoop with a long handle (not a pyramid shaped bowl but a scoop). The rice tastes of coconut milk and I can't detect any fragrance of pandan leaves. The sambal is on the sweet side. The fried chicken leg alone costs MYR6.80 as an add on if you choose to order another one. Teh Tarik - MYR3.60++ for a small cup. 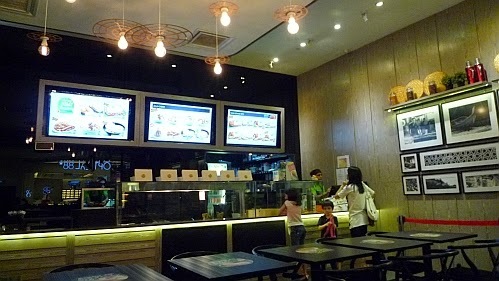 Place your order at the counter and pay before your order gets delivered to you. There is a breakfast set menu from 8am to 12noon where items cost about MYR6.90++ and you need to top up MYR1 for either a coffee o or teh o. We did not order from the breakfast menu because we wanted to try the fried chicken leg which is not on the breakfast menu. 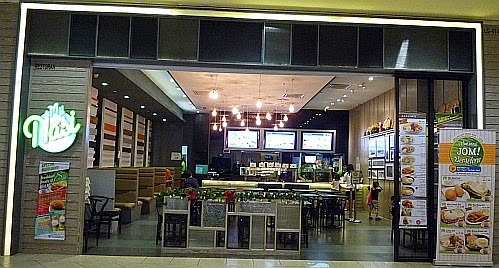 Located at LG of Midvalley Megamall. Used to be Kungfu Paradise but changed to MyNasi which is still under the same company as Kungfu Paradise. the chicken thigh with drumstick looks huge! the place looks so empty when u took the picture...u must be the early birds there! Too bad the rice doesn't have that pandan fragrance. I love my nasi lemak to be rich with the aromatic pandan. Do you plant pandan at home? I like nasi lemak with lots of liew and lauk, just like your one.. Love it with kerang, fried chicken and lots of sambal.. 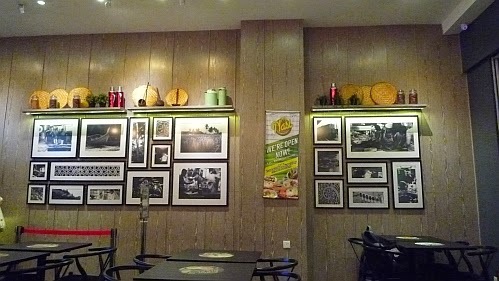 The place is still empty.. You must be early, having brunch there? You are right. We were early. Now, that's beautiful! Gotta look out for it the next time I stay around Mid Valley! Your plate of nasi lemak with fried chicken drumstick looks so yummy. oh!!! i didn't know the Kungfu Paradise has closed down and now becomes this MyNasi.. but this MyNasi looks empty just like Kungfu Paradise, there is no customers (or just a few) inside but a couple of staffs standing outside to lure business.. the nasi lemak looks good, and i hope that would bring their business back to track.. Still early. Later will have more. Oh thought it was Teh Tarik place at first. Somehow noticed a few such new outlets recently. 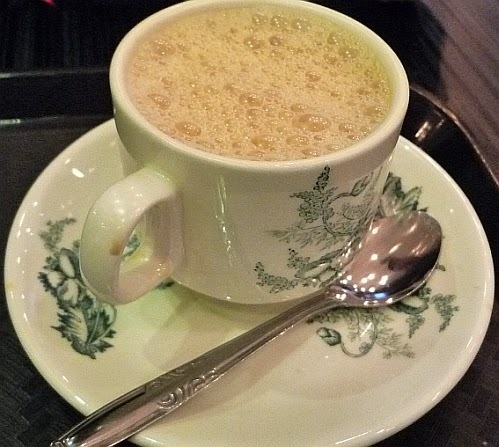 I know teh tarik place. Decor looks quite similar? Oh dear, I can see how this is going to go. Same company but change shop name and pattern. I suspect the food is only so so? This Paradise Group is from Singapore. Big group too. Food is acceptable. This is very lemak. Just no pandan fragrant. Kfc seems a bit cheaper? The portion size looks quite generous. I love nasi lemak! The turky leg looks big. The chicken leg is huge! Whole leg so is huge. Wow! That's a little on the expensive side (can get RM 5.50 nasi lemak with a piece of freshly fried chicken in Kota Damansara where I live - drums and thighs are that price while breast meat and wings are RM 5) but your chicken leg is WAY bigger than the ones I'm used to being served. It looks great too, and I'll love to have more sambal! Merry Christmas to you and your family Mun! May the festive season bring you all hope, peace, joy and love. Thanks. Same to you too. They are still fine tuning the taste of the sambal. I am not aware of this outlet but it seems interesting and sells my type of food. This is a new outlet.